We've got the day-to-day covered. Our backend operations suite of tools handles hundreds of critical functions - from customer service, to billing, packing, routing, reporting, and so much more. Instantly access a customer’s full profile and history with instant search. Edit individual orders and recurring items, review payment histories, issue credits/adjustments, set vacation dates, view balance, and a plethora of other customer-centric functions. Have the satisfaction of knowing any traffic you send to your new website will be able to easily find the signup mechanism and be walked through creating their profile and first order. Easily setup automatic communications to go out at scheduled intervals for new customers, as well as have the system followup after their first delivery! You control the content...our system makes it easy to educate customers on how your business works. Existing customers can login and edit. Any of the details of their next 4 upcoming deliveries (until your cut-off time), set vacation dates, change personal information, enter a credit card on file for billing, or view/print past invoices, bottle deposits, payments, adjustments, credits, and other account activity. When customers enter the shopping section of your new website - they're exposed to your full product list, featured products, sale items, first time order specials, new items - and suggestions for other items they might like in coordination with what they are currently browsing! Set alerts and reminders easily. Customers can set their own "reminder" intervals and have the system alert them via email or text message (requires texting service) within their chosen timeframe of an upcoming delivery date. Access customer payment histories and enter check payments, apply credits, and make misc. changes such as bottle deposit returns. Easily see what their balance was after any transaction, or their current balance...just like your bank statement. Easily establish recurring notes for customers, or detailed line item notes. The system will record who entered it, on what date, and you can even set a followup date so that you can be reminded of customers that need calls or emails at specific times. Track all of your phone conversations with customers, or simply use it as a reminder board of who needs to be contacted. Customer startup and welcome emails. Send out customer startup/welcome emails at the click of a button - pre-populated with their start dates, route names, and other pertinent information. In addition, you control several auto-responder emails - it's easy to have the system followup immediately after registration, and then again after they place their first order, and then again after they receive their first delivery...it's entirely upto you. Or...let the system automatically assign customers to routes based on your parameters...and never have to manually send a startup email again! Quickly search for customers, access their information, and make changes to payment methods, driver notes, profile data, route assignments, orders, billing, and so much more...instantly see what route they are on, when they regsitered, when they last logged in, when they last updated their order, etc. Create new customer accounts while on the phone, establish their first order, and assign them immediately to a route...easily be able to offer upsells and first time order specials while on the phone. Take control of all the customer details with ease. Disable users, put them on hold until a certain date, or assign them to a specialized membership level where they can take advantage of discounted pricing, delivery charges, or new categories of products. Set a vacation hold, or enter a simple note to the driver that the cooler is on the back deck this week. The system will take over from there - pausing their recurring orders from generating, and removing an orders within the vacation date range that the customer isn't past their order change cutoff for...easily setup several sets of vacation dates - plan out your entire year at once! Search for orders in a myriad of ways. Instantly by customer name, address, phone, what was ordered, when it was ordered, by route - you name it - you can search on it! Easily view the customer's YTD sales and last login, registration, and order edit dates from the customer profile screen - alternately view their entire order history and account activity at the click of a button. Admins can quickly add several products at once from different categories to an order - keeping track of what they've added before getting confirmation from a customer on the phone. Upsell customers on the phone. 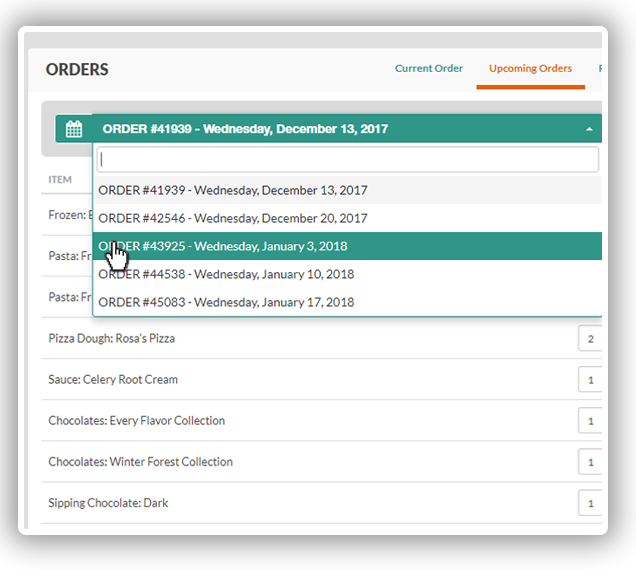 Easily view the customer's available first time order specials and cross related items while on the phone editing orders. Make use of our tablet software and put order changes in the hands of your drivers. With a few simple touches of the screen they can edit, delete, and enter new orders, print invoices, collect deposit returns, get directions, text customers, and more! 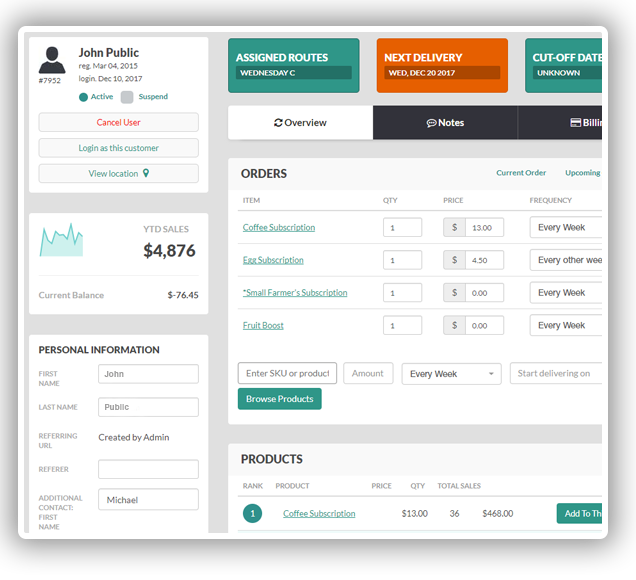 Easily setup an order with variety. From every week to every other week, once per month, and order in advance options - you and your customers can schedule out deliveries months ahead of time, and choose when to start recurring items. Go back in history and look at trends in buying. How many people ordered Eggnog last Christmas, do you remember? Pull up any order placed within the history of the system and edit it, re-print an invoice, email the invoice to a customer, etc. Drivers back from route with order changes? Let your staff edit orders in the same sequence as your drivers delivered the route - no more sifting through papers and looking for a particular customer - staff can already work with customers in order of their delivery! Quick jumps are built into the system that allow your CSR staff to easily bounce from one customer's order screen to the next - or from a payment screen to another, etc. Admins have full control over adding products to orders past cut-off times, overriding normal prices for a product, and qty minimums, etc. Print specific order-only invoices at anytime. choose one particular order to print, or a range of orders - for example you might print delivery invoices in route order, so that your drivers can drop them off with each stop. 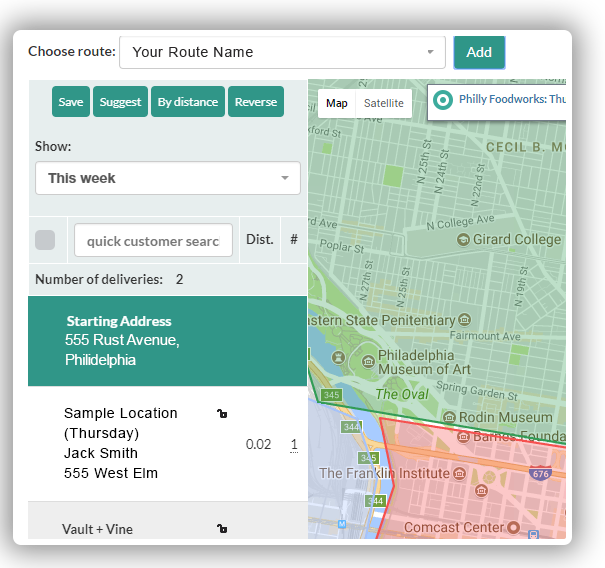 Create as many routes as you’d like, draw shapes on a map and let our system automatically assign customers to routes. Visualize your route stops, suggest the best route, drag & drop, position by distance – it’s up to you! Quickly assign users to routes. From any of the routing screens - easily mass move customers, split routes, change route names, assign customers to multiple routes, and communicate these changes. Re-position customers on your route easily. Choose to dynamically update positioning based on distance from truck origin with a click of a button, or have the system suggest the best route based on drive time - alternately you can manually manipulate stops and their order at any time using drag & drop functionality or number positioning. View maps with pinstops of your routes. Draw shapes to outline your route boundaries, and enjoy viewing your route with all of it's stops from a bird's eye view - or zoom in to a satellite view of a new stop. Set order change cut-off times per route. Customers will automatically be notified when they login if they are past the cut-off time for a particular delivery. Customers can still shop for any of their other upcoming deliveries - 24/7 access to order manipulation. Generate driver load and drop sheets dynamically with the click of a button. Cleanly display and print what needs to be loaded on the truck, and what needs to be dropped off at each stop. Organize your load sheets by warehouse location, alphabetically - or in any other order you'd like....print bag labels with your logo, customer name, and order information...the sky is the limit. With our paper or electronic route sheets - showing what needs to be dropped off to who, notes from the office staff, maps, turn by turn directions, GPS integration, and customer contact information. Use our touch screen tablets. 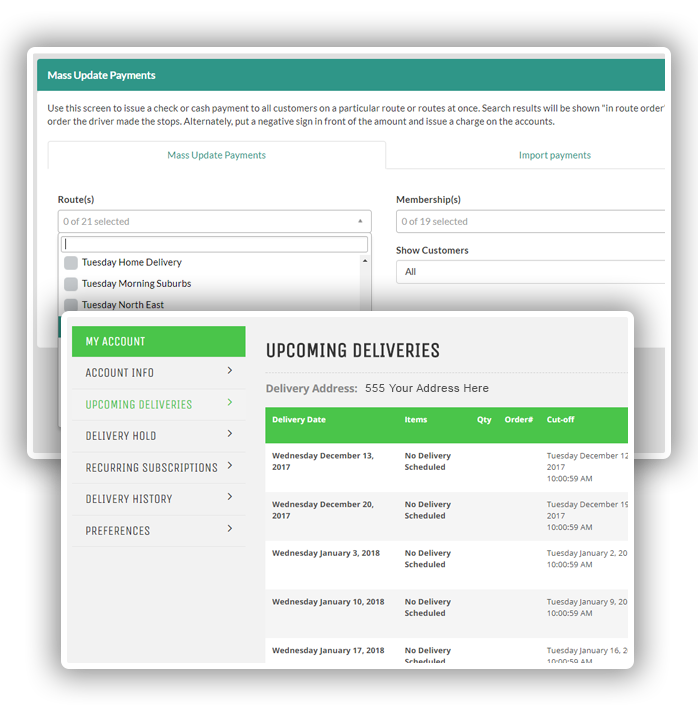 Drivers can modify orders on the road, add new orders, order notes, collect payments, mark deposit returns, print invoices, and skip or cancel deliveries. The possibilities are limitless - we can help you customize your installation. Drivers have their own login and interface. Drivers can re-position their route stops, interact with maps of their route, download GPS files, return deposit items, and study turn by turn directions. Over 30 different types of automatic email communications based on customer actions – delivery reminders, cut-off time reminders, followups after X delivery, birthday alerts, etc. Easily send out general news at your leisure to the entire customer base or specific sub-set. Send emails to your entire customer base, just certain routes, only customers with "x" in their this week order, or other criteria. Use the built-in editor to make fancy formatting changes, upload images, or attach a file - or send out a simple plain text email. Track your emails to customers. Find out how many times it was read, who read it, what links were clicked on - measure the effectiveness of your email campaign. 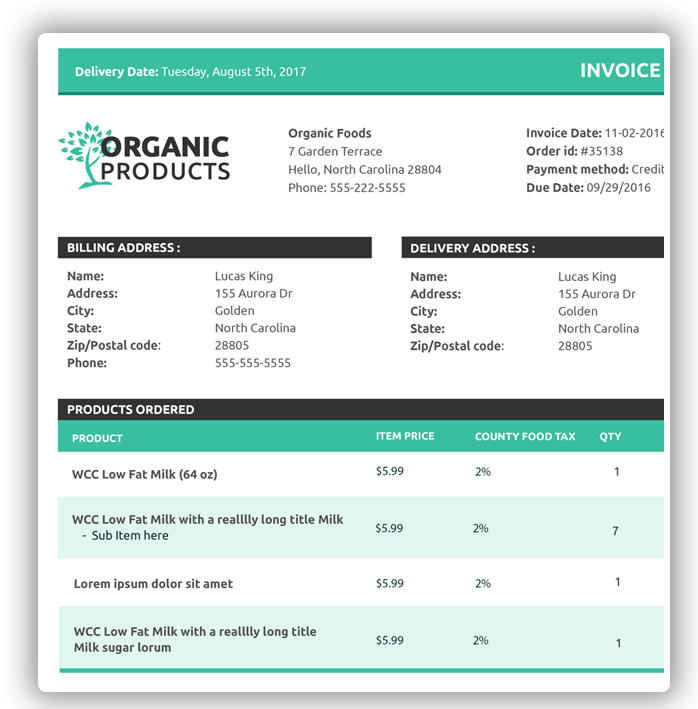 Email invoices to your customers. Email statements, individual order invoices, or a set of order invoices. Give your customers some incentive to place their first order or send them some instructions on how your company operates - maybe include a coupon code to entice them on a new item you are offering - all automatically through your auto-responders. Follow up after the first order. Let your customers know you care and setup an auto-responder to go out via email after they place their first order - just a handy confirmation that you've received their information and are excited about making the first delivery! Follwup after the first delivery. This is a great time to find out how your service was, offer a coupon code as incentive to place a 2nd or recurring order, and let the customer know you care by offering a survey link or friend referral incentive. Either automatically setup a schedule or manually email customers that haven't placed orders in "x" days - use the built in editor to compose a nicely formatted email with incentives for coming back and joining the service again. Track down customers that owe you money - - selectively choose filtered criteria to get down to the exact list you'd like to email, and send them a cancellation notice. customers or admins can setup individual customer delivery reminder email intervals - customers simply login to their account settings, checkbox the intervals at which they'd like to be reminded, and the emails go out automatically. 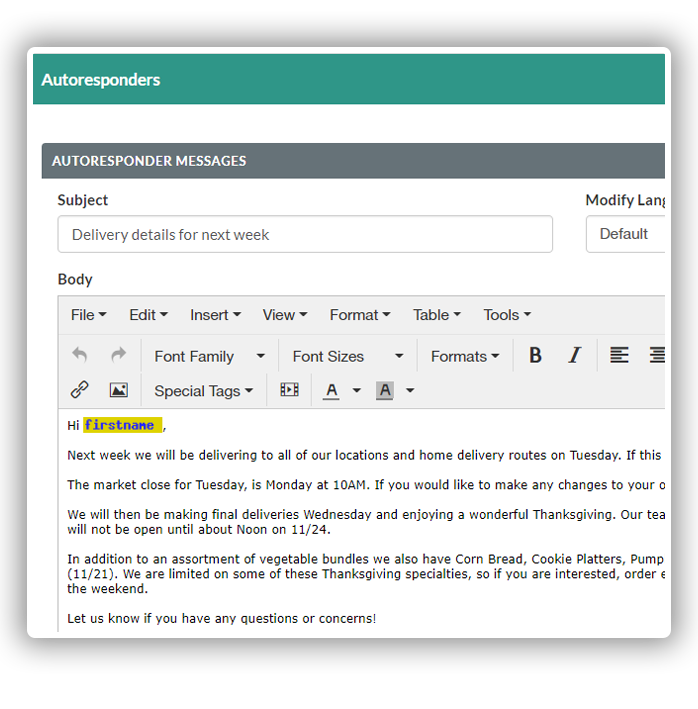 Easily setup automatic emails that will remind customers to place their orders before your route deadline comes into play. We tie in with most of the major gateway providers such as Authorize.net, Stripe, and others. You can bill through our system whenever you’d like – before delivery, after delivery, after cut-off time, once a week on Fridays – it’s up to you! Bill your customers with flexibility - every day, every week, every month, or for orders in the future - you decide. Send invoices and receipts via email or print. Send to all customers, specific routes, in route order to send out with the drivers - or send them the old fashioned way. Let customers enter a credit card or e-check on file. Search by customer, route(s), date range, or other parameters and bill all selected customers at once. Receive instant feedback on processed and declined transactions...automatically sends customer a receipt or decline notice, and updates their account balance - nothing further to do on your end! Need to post check or cash payments? Simply search for a customer, enter the check number, amount and a note if desired - the payment is automatically applied towards the current balance and shows up in their online order history. Alternately pay specific invoices - and easily get from one customer payment screen to another in one simple step. If you let your drivers collect checks, simply view an entire route at once and enter payments for those customers in route order! You choose what shows up on the invoice - let the system do the math and track past due amounts, deposits and returns, registration fees, delivery fees, and more. Have drivers on the road with our touch screen tablets? They can enter payments directly into these units and sync with the database once back at the office. Hookup a printer and "voila" - instant accurate customer invoice from the truck, including any items that were returned or changed at the door! And so much more... our list of features and functionality grows each month - that's the beauty of web-based software! Each product has a myriad of settings to help you control behavior – from “recurring only” to pre-order products like turkeys for Thanksgiving, you can be sure we have a product setting for your particular need. Create as many categories and products as you need. There is no maximum - organize them in a fashion that makes sense to your customers. Full control of product information. Enter the descriptions, the images, what categories the product lives in, the supplier, pricing - and any other special rules that apply - from minimum order amounts to cost and inventory information - all the way down to warehouse location. Get fancy with our built-in editors that allow you to insert even more images into your description areas, or get fancy with formatting and links to additional information for products. Special pricing/products/delivery fees for different routes or areas? No problem - assign membership levels to customers automatically or manually and easily control pricing, products, categories, delivery fees, quantity discounts, and more. In addition, offer memberships for a price and incentivize customers to pay more up front, for a better discount in the long-term. Charge for produce or meat by weight easily...either sell exact sizes or adjust weights in orders as they are packed. Give qty discounts and extended pricing to your retail customers and stores - alternately show them a completely different set of categories and products than "normal" customers! Easily enter orders "at the door" using our driver software - and print accurate invoices or collect signatures... the possibilities are endless. Track Inventory and Quantities in System. Set minimum quantity orders, assign products to suppliers, create purchase orders - check-in inventory on received product, track real-time inventory - create purchase orders based on real-time data within a set date range - easily fax, email, or give suppliers access to the system to print their own! Allow your suppliers to login and manage their own products, their own inventory, prices, purchase orders, and forecasts. You control which suppliers have access to which functions - or you can maintain your products and inventory in-house. Easily designate certain products to be packed separately of other products - such as produce or meats or cheeses - that might need special handling during the packing process. Setup taxes and choose which products they apply to - - or mark a product as tax exempt. Similarly - create deposits and assign those to orders, customers, or products - and choose which deposits apply during which situations. Track profit and sales per product, per route. With reports like overall sales, sales by route, sales by product, advanced pricing and date range searches - the data is always at your fingertips. Easily control what date ranges a product is available for - and mark whether it is allowed to be a recurring item in a customer's order, as well as what routes it's available to. Simply highlight days or weeks on a calendar, hit save - and those are the only order date ranges a product can be added to...alternately set a season date range - the products will automatically be removed from the website after your specified criteria. Not sure how many turkeys you'll need to obtain from your 3rd party supplier for Thanksgiving? Set it up as a pre-order product months in advance and collect the money before you start delivering! Or, simply start gathering real-time data on customers that would like to pre-order now, and generate easy reports on how much of a product you'll need when it comes time for delivery. You control the weeks/days it gets delivered, and the customer is automatically made aware of your parameters while shopping. Cross-sell related items to customers. If they are browsing your bread, why not offer them butter as well? This is a great way to increase sales and it makes it easy for customers to act on impulse buys... Offer first-time purchase discounts and specials automatically to customers...all based on their previous order history - you set which products are participating in the first time order specials and can even set a date at which they will go back to their normal price! Control featured products and sale items. You control which products are shown first when customers shop, and which items are on sale...easily keep this fresh each week with a few clicks of a mouse. Inventory goes up/down automatically based on customer ordering actions – easily update inventory levels through backend admin reporting or import/export of spreadsheets. Track real-time inventory in the system - automatically get notified when quantities reach certain levels. Single/Combined item inventory tracking support. For example you can easily track the number of bottles, bottle caps and bottle labels you are using with the ability to forecast upcoming needs...you always have at least 4 weeks of orders within our system. Produce inventory reports and mass update inventories. Either from the inventory report itself or from the product search results screen....or on an individual product modify page - it's upto you. View your inventory as of today, or total inventory including all future orders already placed. Import new inventory numbers from a spreadsheet...or enter them for group of products - all at once. Only allow ordering up to stock levels. Optionally only allow customers to purchase upto the amount you have of a product in stock - then automatically display the product as out of stock on the website. Alternately allow customers to purchase as much as they'd like, and simply use the system to let you know when you need to re-order. Create purchase orders for suppliers/vendors based on real-time data...simply choose a supplier, a date range of orders - and let the system auto-populate from there. Make adjustments as desired, and save...print or send a PDF to your supplier. Automatically check-in inventory as it's received straight from the purchase order screen. Or, optionally use our touch screen tablets to check-in inventory from the field or warehouse.